The #RhodesMustFall protests at the University of Cape Town have just jumped borders. A group of students at Oxford University in the United Kingdom have begun to demonstrate against the Rhodes statue in solidarity with students at UCT. Students in Rhodesâ€™ home nation arenâ€™t too impressed with the colonialist hovering over their university. Ntokozo Sboh Qwabe, a student from South Africa studying at Oxford, took to Facebook to show that Rhodes isnâ€™t just a problem in South Africa â€“ his legacy is contested all over the world. â€œDespite public order police being called to remove us prematurely, nothing could stop us from conveying the message! Rhodes Must Fall everywhere!â€ Qwabe wrote on Facebook. Post by Ntokozo Sboh Qwabe. 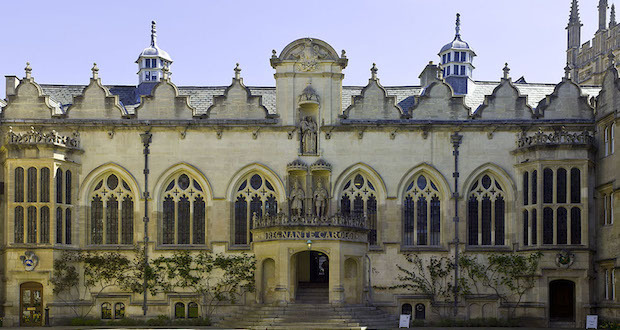 Oriel College, which is home to 450 students from â€œall kinds of schools, backgrounds and countriesâ€, is one of the oldest colleges at Oxford University, which is made up of 38 colleges. But with Rhodes standing above the doors to Orielâ€™s entrance, evidently the prestigious college isnâ€™t as welcoming as it likes to think. At Rhodes University in the 1980s, Cecil Rhodes scarcely figured in the public consciousness. Africans had more recent oppressions to deal with and English-speaking white South Africans, if they thought of him at all, identified him with Zimbabwe which had so recently been known as Rhodesia. Among South Africans, only Afrikaners appeared to recall him,usually in negative terms and associated with the Anglo-Boer War. It is difficult no to think that this has not been whipped up artificially, but that is not to say that it cannot gain momentum nonetheless. The staggering amount of hyperbole in this article is staggering. There are seven people in the demo, yet your piece eludes to the entirety of Oriel College, then Oxford University, the UK and even “all over the world”. I’m all for the statue being removed from its current site, all for the discussions around race and transformation, but really guys – even here within your own comfortable echo-chamber – get a goddamn grip. Hello Dave. Maybe you missed that tiny detail in the intro: “a group of students”. There is no suggestion any where in the story that every student in the UK were now protesting against the statue. Perhaps if your article mentioned the outrageous, faeces-scattering and thuggish actions of the Cape Town Rent-a-crowd at UCT, it might have appeared more balanced. Another aspect of the UCT event is its purely racist underpinning. It was never really about Rhodes; and yet another is the fact that the Oxford student has taken the Rhodes funding, but bites the hand that feeds him. If he were morally true, he would never have accepted the honour. All in all, it seems more a ploy towards instant fame (or infamy) via social media – something which would be unattainable anywhere else. Ntokozo Qwabe, a South African student so feeble-minded he cannot pass a Cecil Rhodes statue without having his â€œsafe spaceâ€ violated is the recipient of a Rhodes scholarship. Clearly he does not feel sufficiently â€œviolatedâ€ to give up the long-dead mining magnetâ€™s money and depart Oxfordâ€™s groves of academe for his home in the hills of Natal. He is perfectly within his rights to squander his time on silly, vexatious, single-issue political campaigns but I trust those carrying out the Rhodes vetting procedures have taken note. It would be a pity if Americaâ€™s loathsome political correctitude was to replace free, open debate with petty grievance-mongering, identity politics and empty sloganeering.